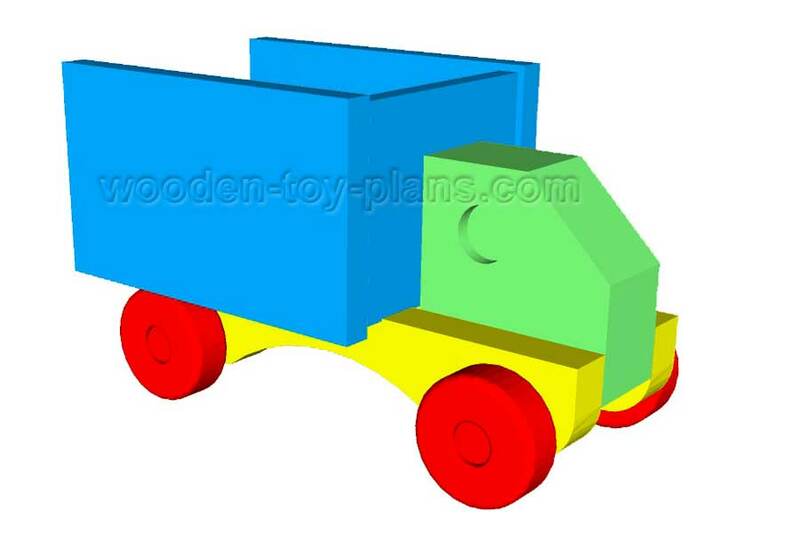 These free woodworking toy truck plans feature a simple design full of character. Do you have a lot of scrap wood lying around. Put it to good use by making a collection of toy trucks. Some people would call this up-cycling. Even though wood is a renewable resource, it is still an expensive commodity, as woodworkers would know. It makes sense to make every bit of the tiniest bit of scrap of wood into something if not useful, then something that would bring joy to a child. You can even make your own wooden toy wheels. 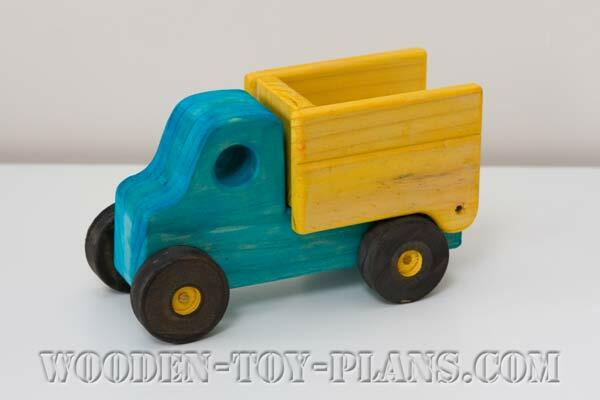 This wooden toy truck could become part of a small collection of wooden toys to be given away. What about selling them at market fairs? I'm sure you would agree that they would become a best seller, especially if you use some of the more exotic and colourful woods, suitably finished. Bright colours are always appealing, and you should really use child safe paints. There is a lot of information on this subject amongst toymakers. 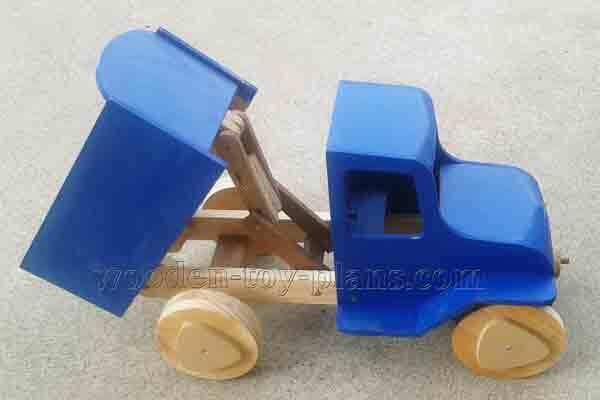 Simply download the free woodworking toy truck plans and print them on your home printer. 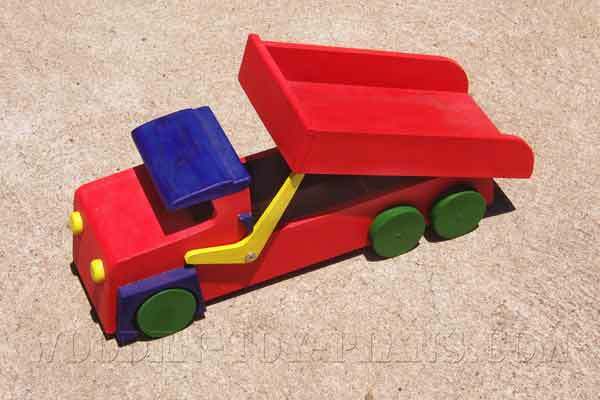 Look for a file "free_woodworking_toy_truck_plans.zip" in your downloads folder. This zip file contains the full size patterns to build this toy truck, and an extra plan to build another slightly different design. If you do not have a printer at home, your local library or office supply store would be more than willing to oblige. The plans are drawn at full scale on an A4 size sheet, which measures 297mm x 210mm, slightly smaller than the size called legal in some parts. If you plan on making more than one wooden toy truck, it would be a good idea to make a template out of plywood or MDF, or even masonite. No need for power tools here, but if you happen to have a scroll saw, that would be great. This project can easily be made with a handsaw, a wood file or sandpaper, and an electric drill. If you are going to make your own wooden toy wheels, a drill press is an essential tool. Besides, when drilling the holes for axles for wooden toy wheels, it is important to be accurate as possible for the wheels to turn freely. There is one other tool, if you can call it that, for the production of toys with wheels. It is used for making plastic washers, and it is a hollow punch. Many years ago, in a place far, far away, my grandfather used to make rubber washers for taps, sometimes called faucets for some strange reason. It was a time when the world was not as sophisticated as it is today. Hollow punches are still available today, and I use mine to make washers using plastic milk bottles. You only really need one size for the diameter of the axle. Any pieces of scrap wood would be quite suitable for this project. Laminate with a contrasting colour in the middle would be a good idea. Trace out the shape onto a suitable piece of wood and cut using your preferred method. Using a drill press, or even a drill guide, drill the holes in the position shown. Dry fit the wheels, making sure the wheels spin freely, maybe even rubbing a bit of candle wax on the axles. Depending on the thickness of the body of the toy truck, cut out the tray back to size. It would be best to round over the edges before gluing the two parts together. Paint the toy before fitting the wheels, not forgetting to use the plastic washers you made earlier. All of the free woodworking toy truck plans featured below are designed to be made from project timber ranging from 1/2 inch to 3/4 inch, laminating for thicker parts. Some parts can be made from 6mm thick MDF or plywood. 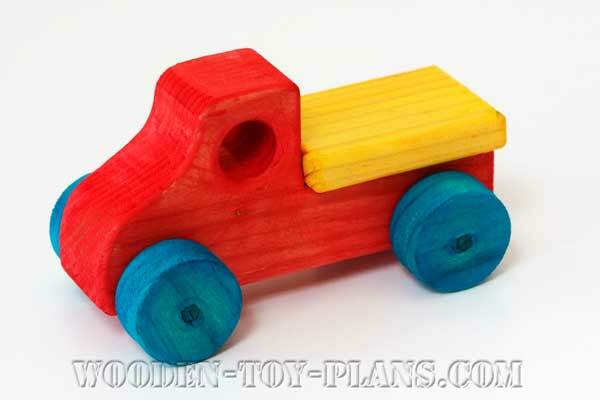 Free toy fire truck plans from woodworkers workshop.